Lubuntu is working towards gaining an endorsement from Canonical and thus becoming an official Ubuntu derivative. Lubuntu is an LXDE version of Ubuntu just as Kubuntu is a KDE edition or Xubuntu is an XFCE variation. Since I just recently acquired my T101MT I was looking for a solid lightweight distro to run on that would still provide we with the power and flexibility I was used to from Ubuntu, thus it is only natural that I should choose an Ubuntu derivative. The first thing you will notice about Lubuntu is that unlike most distros that have to cram every megabyte they can into their LiveCDs, the Lubuntu ISO download is only 521 megs. The ISO loaded right up onto my USB drive thanks to unetbootin and I was soon installing Lubuntu on my tablet. The installation of Lubuntu is decently standard. It is the same installer Ubuntu uses. It provides the option to install along side an existing operating, using the entire drive, or setting up a custom layout - all using gParted. About ten minutes later I had Lubuntu up and running on my hardware (I love USB installations). Also if you already have some form of *buntu 10.04 installed on your computer you can add an LXDE/Lubuntu install by installing the lubuntu-desktop package via apt. Lubuntu's default theme is a sleek looking blue that blends well with the Chromium and PCMan icons that are on the task bar by default. 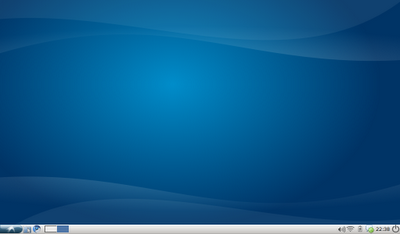 Those migrating to Lubuntu from Windows will also feel at home in the LXDE desktop due to the positioning of the main menu in the lower left and the tray icon in the lower right. Lubuntu lacks the flair of Compiz or E17, but this is by design. It's goal is to be a fast, lightweight operating system. I really like the default software the Lubuntu team has chosen to include. The first thing you will notice is that the stock webrowser is Chromium, this is a change I think we will be seeing a lot more in light-weight distros. Don't get me wrong - I like firefox, but compared to Chromium it is a snail at best (and a bit of a resource hog). Pidgin is the default messaging client, xchat is included for IRC usage, and transmission is there for all of your torrenting needs. In respect to office software Lubuntu ships with abiword for word processing and gnumeric for creating spreadsheets, a refreshing change from the bloated OpenOffice that ships with most distros by default. 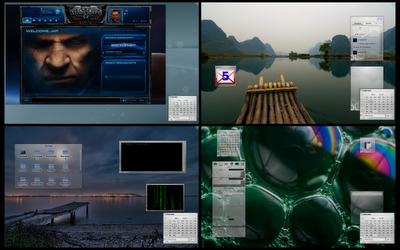 In terms of media Lubuntu comes stock with Gnome MPlayer (my favorite media player), Cheese Webcam booth, Aqualung, and Xfburn. 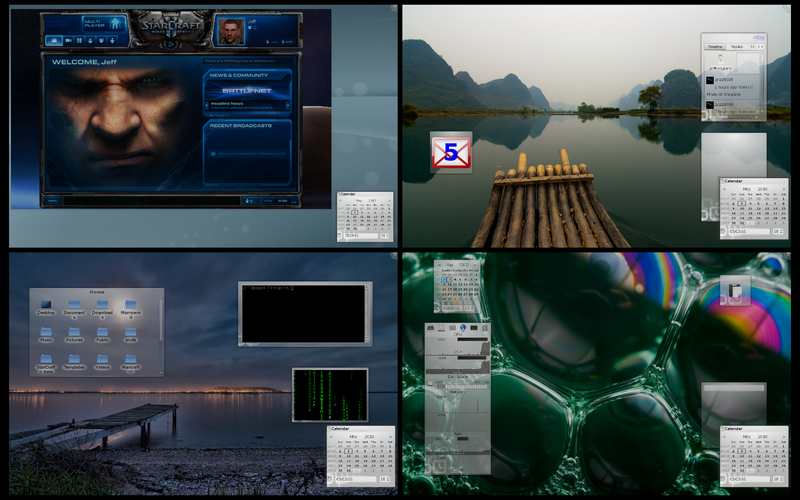 For system tools the Lubuntu team has taken their pick of various gnome and xfce applications. From Gnome Lubuntu uses their sound applet, wifi applet, gdebi, and power manager. From xfce comes the task-manager and pyneighborhood (network browser). In the means of terminal Lubuntu comes with LXTerminal. A nice extra that is included in Lubuntu by default is a copy and paste manager "parcellite"that is very similar to the KDE "klipper" tool. I'm glad that this is included as klipper is typically one of the first things I install on any non-KDE distro I use. Parcellite is not loaded at startup though, you will find it under accessories in your menu. While not as powerful as Gnome's gedit, but sticking with the lightweight theme, Lubuntu comes with leafpad as the default text editor. Also in a default Lubuntu install for graphics editing is "mtPaint", a basic image editor. The only real "issue" I see with Lubuntu is the fact that the LXDE desktop does not support volume up/down/mute function keys on laptops by default. This is easily solved by mapping them using xbindkeys - but this is something most new user will not want to do. Lubuntu has come a long way from it's first release with 9.10 just last year. This 10.04 release is a fantastic addition to the world of light weight Linux distros and just like the others in the *buntu family I have no doubt it will adopted by many for use on slower/older computers. Earlier this month I talked about why I feel Asus's T91MT is a better computer than Apple's iPad. 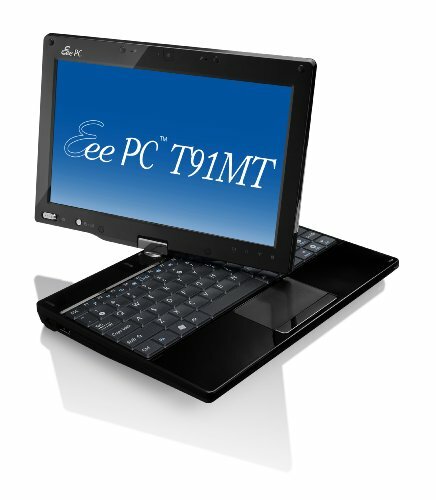 What I failed to mention in that posting is that in addition to the T91MT Asus also has a T101MT netbook/tablet hybrid. If you are in the market for a tiny tablet computer you might be like I was, torn between which of these two netbooks to buy - they are fairly close in price! After having owned both a T91MT and the T101MT I have put together the following compare and contrast of the two tablets that will hopefully help you decided which of the two to purchase. Lets start with the obvious - how big these devices are. The average consumer will first notice that the T91MT is an 8.9" tablet that weights in at 2.1 pounds while the T101MT is 10.1" that weights in at 2.86 pounds. Which of these is better? Its a personal choice really. The track back on both the devices is essentially the same. 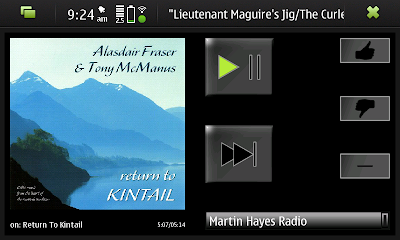 Same look and feel, same silver mouse button. Neither supports multi-touch on the track pad and both support scrolling on the right side. Both the netbooks contain the fairly standard 1024x600 resolution netbook panel. Both panels fully support multi-touch. For some reason though the touch layer is much more noticeable on the T101MT than it is on the T91MT. If you look at the screen from the wrong angle the contents appear blurry almost. Another thing you will notice right away between the two laptops is that the T91MT has a shiny finish on the back of it's screen - meaning it is a giant finger print magnet. The T101MT has a matted finish that tends to stay much cleaner. Lastly the hinge on the T101MT is much smoother than the one on the T91MT. When closing the T101MT (or putting it in tablet mode) it has rubber stoppers that are designed to slip into slits cut into the screen so the keyboard part does not rotate out form under the screen while you are moving the device around. This was a much needed design additive as it always annoyed me that the T91MT screen does not sit straight on when the device is closed. The processors in these two devices are very, very different. The T91MT uses a Z series 520 chip that is clocked at 1.33ghz, while the T101MT sports an N series 450 chip that runs at 1.66ghz. Both chips have hyper-threading technology and of the two only the Z520 supports virtulization (just in case you wanted to run a virtual machine on your netbook). The extra speed of the N450 is decent noticeable. It is much "snappier" when multi-tasking than it's Z520 cousin. Both tablets come with 1gig of DDR2 memory and are upgradable to 2gigs. The only thing worth noting here is that the T91MT has a 1gig stick that you have to replace with a single 2gig stick in order to upgrade it's memory. The T101MT on the other hand has it's default 1gig of memory soldiered to it's mother board - meaning in order to upgrade it's memory you need to purchase a 1gig stick. The T91MT comes stock with a 32gig SSD while the T101MT comes with a 160gig 5400rpm standard laptop drive. The T91MT hard drive uses a PCI mini port to connect - meaning if you want to change the drive in it you are somewhat limited on selection. The T101MT on the other hand uses your standard 2.5" sata hard drive connector so you can drop any mobile drive in it (personally I ordered an SSD with my T101MT, I feel a normal hard drive is just a bad idea in a netbook). Both the netbooks come with very sad .3 mega-pixel cameras. Good enough to make a video call over Skype, but not a quality image by any means. The T91MT comes with the Intel GMA500 graphics card while the T101MT has the more standard Intel GMA3150 graphics controller. An important thing to note here is that while the GMA500 is a physically faster graphics card, the drivers for it are decently horrid on all platforms (although they are the best under Windows 7). The GMA500 should do 720p video playback however do not expect it to be 100% smooth if this is what you want to play on the device. The driver issue with the GMA500 is largely due to the fact that Intel doesn't actually make the GMA500 chip, they just stamp their name on it. The T91MT ships by default with Windows 7 Home Premium while the T101MT ships with Windows 7 Starter. Not a big deal right? Actually it is. Windows 7 Starter does not support multi-touch functionality regardless of your hardware. 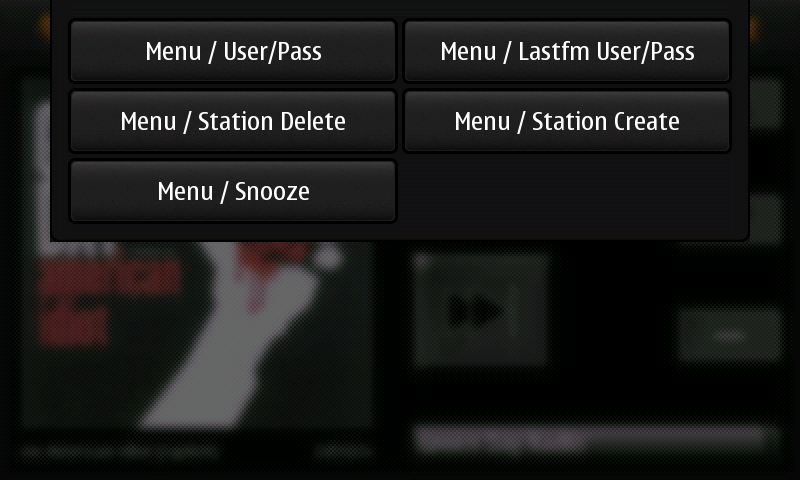 Meaning if you want multi-touch on the T101MT you will need to upgrade/change the Windows version installed on it. Both of the netbooks run Ubuntu quite well with a small bit of hacking (and have multi-touch with kernel > 2.6.33). If you are going to keep Windows 7 on the tablet however, do yourself a favor and make sure to upgrade the RAM to 2gigs. The T91MT has a built in bluetooth controller while the T101MT does not. So if you are needing bluetooth on the larger tablet be sure to pickup a USB bluetooth adapter. The T91MT claims "up to 5 hours" and the T101MT claims "up to 6.5 hours". Off a full charge while streaming audio over the speakers from Pandora the T91MT gets just over three hours and the T101MT gets just under four hours. The T101MT has has a removable battery while the T91MT does not, personally I really like having a removable battery so I can carry a spare. I ended up keeping the T101MT and selling the T91MT to a friend. The two main deciding factors for me in this decision was the battery life and graphics card (the GMA500 is a giant pain under Linux). Which of these two tablet is right for you? How would I know! Hopefully if you have been trying to decide between the two of them this article helped you decide on one or the other. If you have graced my page before then odds are you know I love my N900. This past Wednesday Nokia released the PR 1.2 update for the N900 and one of the features they added was support for the front facing camera to make video calls. Video conferencing via services like Skype, Google Talk and Allstream Business Communications are a fantastic advancement in technology. I would like to note that in order for the video call options to appear I had to first receive a video call on my N900. 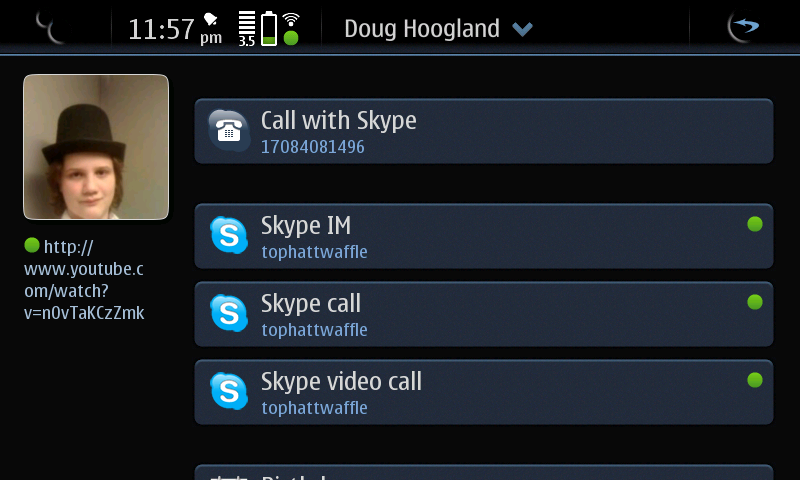 After this I had no trouble initiating a video call from my device. 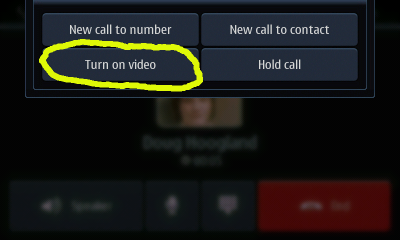 Video calls such as this are by far the way of the future! Hopefully we will see more devices follow in the N900's footsteps and start adding this functionality. EDIT: If you stumbled upon this page looking for a HOWTO for getting Starcraft 2 working under Wine check here. 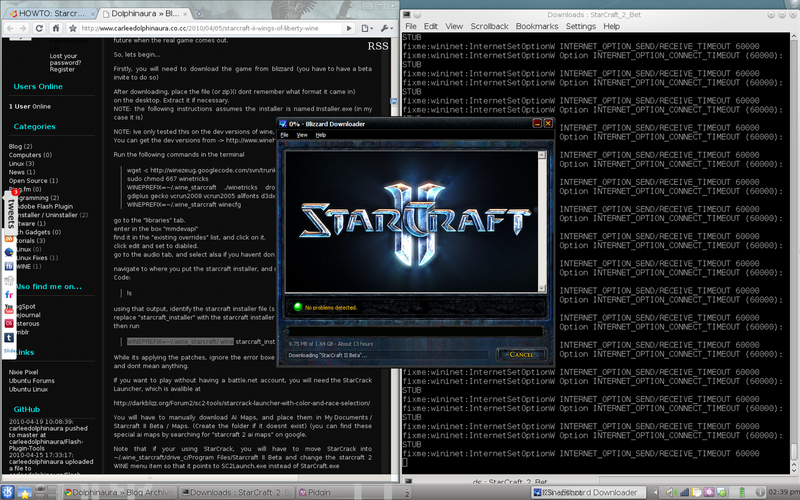 I mentioned earlier this month that I was enjoying the Starcraft 2 beta on Ubuntu 10.04 thanks to Wine software. In my previous posting I had simply stated that SC2 was "playable" under Wine. I have a fairly powerful gaming laptop that sports an nVidia 260m GTX and a 1680x1050 resolution panel. SC2 defaulted itself under Wine to "ultra" settings on my system - after playing one game at these settings (well it was really more like playing a slide-show). I promptly lowered the details and textures to low (while leaving the resolution the same). With these settings I average around 40 FPS at the main menu and in game. At the high end I see just over 50 FPS while playing and at the low end it bottoms out around 20 FPS in combat. (For those wondering how I obtained these numbers press control+alt+f to put an FPS counter in the upper left hand corner of the screen while in SC2). These numbers come from the latest SC2 patch as of today (05/25/10). Now for a bit of an ironic story regarding SC2. Late last night I dual booted my system with Windows 7 Ultimate again due to the need for an embedded youtube video to work in an Office 2007 power point presentation (it failed to work under Crossover and youtube plays poorly in VMs, thus native install was my only option left). Back on topic - since I had Windows installed anyways I figured I would copy over my SC2 files (god bless Blizzard and their portable installs) and see how comparable the performance was on the native operating system. Needless to say it performs better, in fact the FPS I see under low settings on Wine is about equal to the same FPS I was seeing under high settings on Windows. That is about where the things that worked better under Windows ended for SC2 on my computer. I would like to prefix my following statement with the fact that my network drivers are installed, working, and I had used several other applications online just fine. When I joined my first SC2 game on Windows I had just selected my workers to start mining when the lag started, around two minutes later I was dropped from the game and it counted as a loss in my ladder league. I figured it was just something funky with my internet line, even though I had not had any issues in SC2 under Wine in the last three weeks, as such I promptly selected "find match" to start another game. Two minutes later I had "lost" another ladder game due to "connection" issues. Just out of curiosity I decided to boot in Linux to see if the issue existed there as well (I'm hoping the irony of rebooting into Linux to play a game isn't lost on anyone). Needless to say the problem was not present there, after sweeping two ladder games without any connection issues on Ubuntu I can indeed confirm that it was a "connection" issue with the SC2 was only happening under Windows. Yes: I know this game is still in beta. Yes: I know odds are this issue is limited to my system. Is it still annoying? Yep. It is ridiculously ironic? You bet. Anyone else have fun story they would like to share about an application working better under Wine than it does on Windows itself? Now while Ubuntu has a fantastic support community apparently community input on over all design does not matter. Do I think it is right? Not really, but it's their product so Shuttlesworth/Canonical has every right to make executive decisions such as these. The creators of Linux Mint show a very different mentality when it comes to community input and the design of their Linux distro. In fact it is not uncommon to see popular suggestions that occur in their user forums to become a part of the next Mint release. A recent example of this would be the Mint software installer. Built from scratch the Mint software installer was designed to be a better tool than Ubuntu's old Add/Remove programs for users to install software from. Then the Ubuntu Software Center released and put the Mint manager to shame. With Mint 9 the Mint Software manager has again been rebuilt from scratch to feature the best qualities from the old software manager, gnome app-install, and the Ubuntu software center. Now what is the big deal about a distro making improvements to itself in a new release? It is the fact that the creators took to heart what their users where telling them when making this improvement. For some of you this may not be a big deal, but personally I enjoy using a distro where my opinion counts. Back on October of last year I did a comparison of Cedega and CXGames. As of yesterday Codeweavers launched their CXGames 9.0. If we had heard any news or updates from Cedega in the last five months this would be an updated comparison, but since Cedega has not changed I simply am going to be reviewing the newly released CXGames. The first thing you will notice when using CXGames 9.0 if you had used past versions is that the GUI has under gone a refreshing change. Bottle Manager: One of the key things you will notice when installing a game is that there are now "profiles" built in for games. Officially supported games have a profile as well currently a handful of other games. 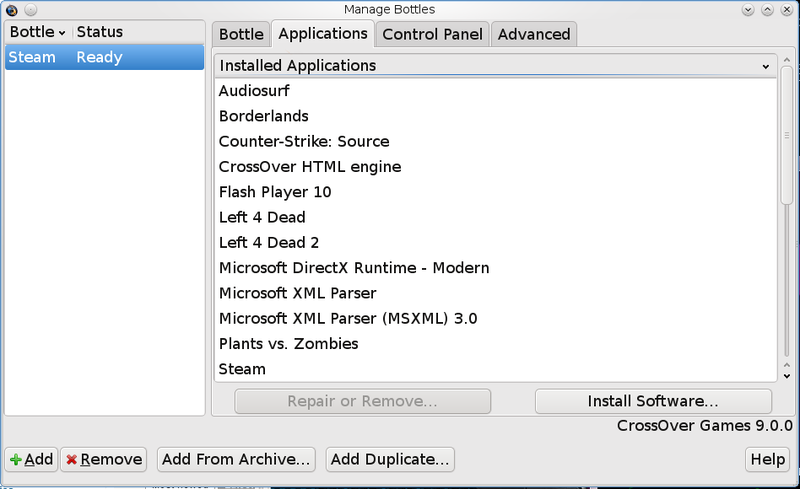 Similar to how Cedega works people can now submit the Wine settings they use to successfully run a game to Codeweavers so others can replicate these settings with a single click from the installer. With the number of users Codeweavers has accumulated over the years I have no doubt that we will soon see profiles for the multitude of gold and silver rated unsupported applications listed in the Codeweaver's data base. New GUI, game profiles, what else is new in CXGames 9.0? A much needed Wine version upgrade has been added to this release. CXGames is based off of the recently released Wine 1.1.42. If you are not aware newer Wine versions often times include many bug fixes that can allow applications that had failed to run under Wine in the past to suddenly start working. The benefit of purchasing commercial Wine software such as CXGames is that while you gain all the benefits of an updated Wine version you do not have to worry about experiencing any regressions that may have found their way into the Wine base. From a gamer's aspect the most important thing about this new release is added support for the recently released Steam GUI. The new interface for the Steam content delivery service I find runs much better under CXGames 9.0 than the old Steam interface ever ran under past Crossover versions. 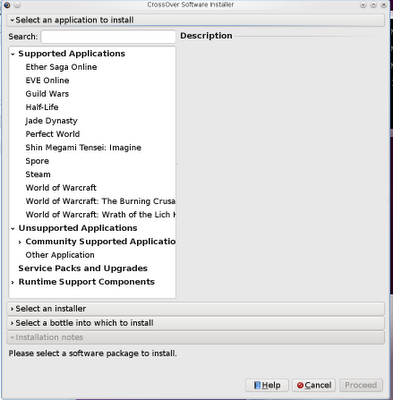 CXGames 9.0 also advertises added support for StarTrek Online and the Starcraft 2 Beta. There is a profile under "unsupported applications" for StarTrek, I am not much of an MMO guy so I have not tested this game yet. 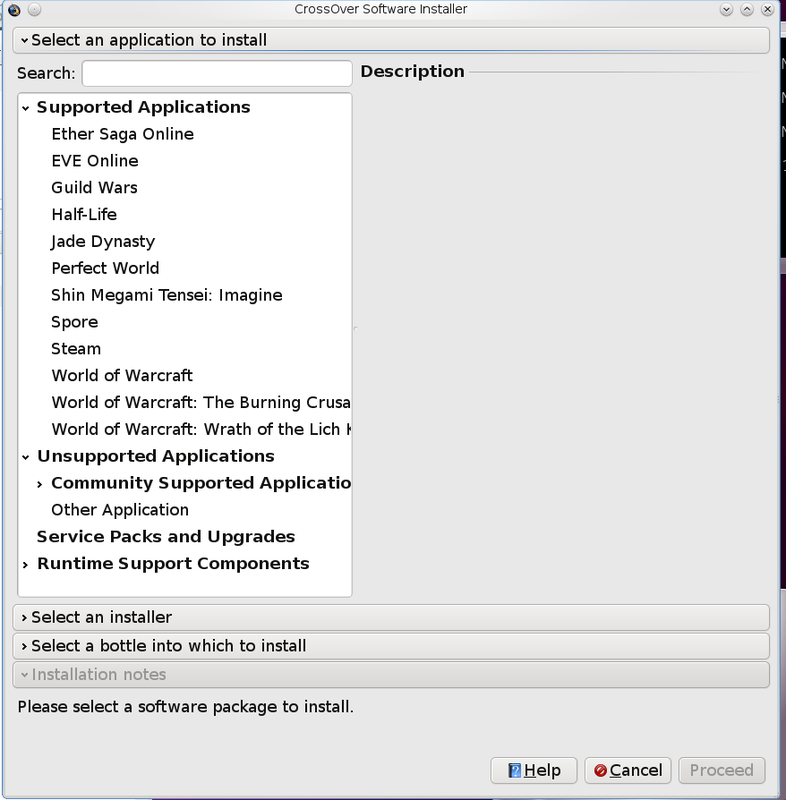 Upon searching for an entry for Starcraft 2 you will not find one, on the Crossover forums one of the staff makes the claim that it just works OOTB when selecting "install other application". I can confirm this is not the case. By default SC2 crashes at upon startup, after some tweaking I have it at least showing me a loading screen (even though it freezes with no terminal output). Finally I always like to mention cost, CXGames 9.0 continues to be 40$ (this includes one year of support and updates). Overall CXGames 9.0 is another great release in a fantastic product line. The GUI updates are for the better, the game profiles work well, and a newer Wine version is always appreciated. If you are a Steam gamer on Linux then CXGames 9.0 is a must have, if Starcraft 2 under Linux is what you are looking for you are going to have to pass on CXGames for the time being - but I have no doubt that by the time SC2 releases at the end of July it will be fully supported under Crossover. Now I've written a couple of pieces about the iPad thus far and if you read through them you will see that the device has failed to impress me thus far. Now despite the fact that I think there are better alternatives out there iPad, all in all I don't think it is a bad device per-say (mostly just over priced). With the idea in mind that a computer is simply a means to an end: if the iPad works to get your job done and you want to purchase it, great! You might understand why they grind my gears. Is the iPad a nifty gizzmo? Sure it is. It is by no means "innovative" though. Innovative implies that something is ahead of it's time. We have had tablet computers for years and the operating system that runs on the iPad is a variation of the operating that was released on the iTouch some three years ago. Is the iPad a neat gadget? Sure. Would the iPad have gotten even half as much press if it didn't have a fruit stamped on the back of it? Nope. 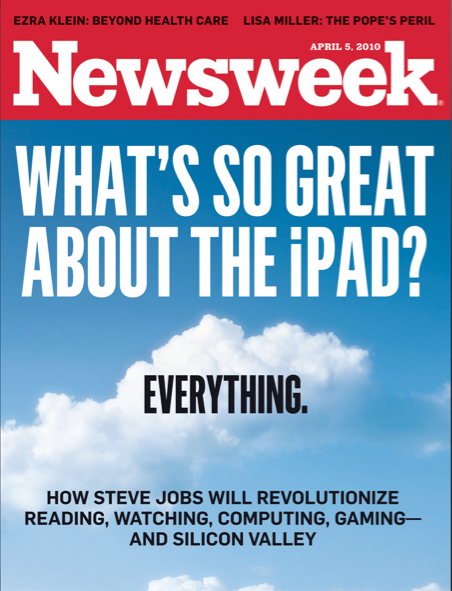 Is the iPad going to revolutionize anything the iPhone or another tablet hasn't already? I doubt it. If there is one thing I have always respected Apple for it is their powerful and persuasive marketing techniques and the iPad is no exception to this. Hopefully though you can see through all the marketing haze surrounding the iPad and see that it is just another computer. Companies release new computers every week, the iPad is no different (other than the fact that it has a fruit stamped on the back of it). Agree or disagree with something I said? Then drop a comment below and let me know. The Asus's T91MT is a fantastic device for many reasons, but one thing I dislike about the device is that it ships by default with only Windows 7. I firmly believe a computer is a terrible thing to waste, so as such the first thing I did was to install Linux on the system when I opened the box. After trying many different flavors of Linux over the course of two weeks I finally settled on Linux Mint 8 as the primary operating system for my tablet device. The following is a summary of how to get the T91MT mostly functional under Linux Mint 8. There are two issues with the wifi I have under Linux Mint, one I have corrected and one I have not. The first is that for some odd reason the wifi in the laptop is disabled at startup - meaning I have to press function+f2 to toggle the wifi on before I can get a connection. My wireless signal jumped from 2 bars to 4 bars at my desk after I installed these. After this finishes (and it will take some time) reboot the computer and it should boot into the beautiful 1024x600 resolution. EasyStroke - Allows you to fire command or push buttons when you pen in certain gestures on screen. Some of the things I use it for are right clicking, switching desktops, and loading my favorite programs. GIMP - You classic image manipulation program for all operating systems. It is fun to play with on the tablet. Xournal - Turns your computer into a pad of notebook paper. Allows for easily importing pdf files to write on and does one click pdf exporting for documents you create. I use this for all my note taking in class. Asileroit Solitaire - Because who uses a real deck of cards anymore? Palapeli - A jigsaw puzzle game. World of Goo - Runs quite well on the GMA500, this one is a blast on the tablet. You do need to purchase this one though. Finally, I would like to mention these instructions pertain only to Linux Mint 8. Due to an issue with the GMA500 graphics driver and the Xorg server higher than 1.6.x these instructions will not work with a version higher than Linux Mint 8. Have any trouble or questions feel free to drop me a line below and I will do my best to answer. Competition is an important part of all markets. It drives innovation, keeps prices down, and typically tends to ensure a quality product. Don't get me wrong, I think Crossover is fantastic software, but with Cedega pretty much being dead where is the choice in commercial Wine software? Lesser known than the two previously mentioned is Bordeaux. Bordeaux is a commercial Wine software more similar to Crossover than Cedega in respect to the fact that it directly uses the Wine project. What makes Bordeaux worth taking a look at? Well there are a few things! Firstly I would like to highlight the fact that Bordeaux updates their software regularly. The version I obtained to use for this review is the soon to be released 2.0.4, which ships with Wine version 1.1.41. The current release, 2.0.0, ships with Wine 1.1.36 (where is Crossover has been shipping with Wine 1.1.24 for sometime now). For those not familiar a newer Wine version typically means support for more applications and better performance for those that already ran in past versions. Worried about buying Bordeaux and then having an new version come out a couple months later? No worries, your purchase comes with free upgrades for six months after purchase. The next wonderful things about Bordeaux is that just like Wine - they support most forms of Unix officially. Bordeaux is available for purchase for the BSD, Linux, OSX, and Solaris platforms (Where is Crossover only officially supports OSX and Linux even though they have unsupported BSD and Solaris builds). Bordeaux is also affordable, at 20$ for the Linux binary it is half the cost of even the cheapest Crossover product. Now for the most important part of any review - the functionality of the product. While the list of software Bordeaux officially supports is not extremely large, they do support many of the key applications that most Unix users require from the Windows environment. These include (but are not limited to) Microsoft Office 2000/2003/2007, Photoshop 6/7/CS/CS2, Internet Explorer 6/7, and Steam. I was pleasantly surprised to see that the recently released new Steam GUI was near fully functional under this latest release of Bordeaux. In fact the only issue it gave me was a distortion of the tray image icon. I loaded up a few of my source engine games (L4D2, Team Fortress, Counter Strike: Source) and they all ran perfectly fine. Bordeaux's GUI for installing and managing software is simple, but functional. 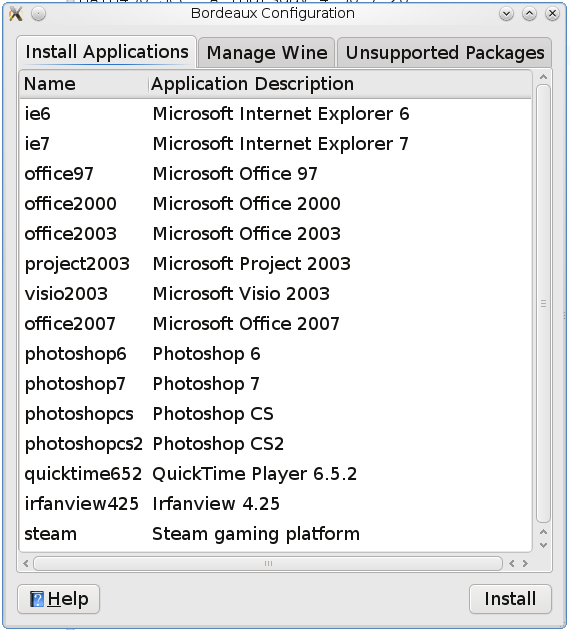 It contains three main sections: Install Applications, Manage Wine, and Unsupported Packages. The Wine management tab provides easy access to tools such as a command prompt, notepad, regedit, taskmgr, winecfg, and application un-installer. 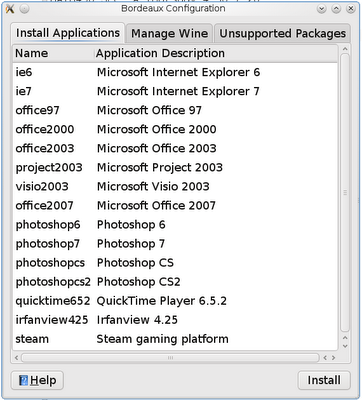 The unsupported packages tab allows for installing all of the various Winetricks packages into a given "wine cellar" (Bordeaux's version of the "bottle" or WINEPREFIX). Over all Bordeaux works quite well and this 2.0.4 release is a step in the right direction. One key reason to pick up Bordeaux over Crossover is if you have need of both Steam and Office 2007 on your Linux install (A prime example for this is if you are a student such as myself and game occasionally while needing M$ Office because your school requires it). To have both of these applications supported under Crossover you would at least have to purchase their 70$ professional package versus the 20$ it would cost to have support for both these applications under Bordeaux. Linux users are starved for quality games - there is no doubting that. Bring up the topic of a Linux port on most gaming forums and you will typically see responses about the market share of the operating system, that Linux users are cheap (thus why they use a free operating system) or there are too many package formats to support (which really is a non-issue). I'm not even going to bother trying to argue the point of market share, we all know Windows is a large majority and Linux is the under dog - lets leave it at that. Lets stop and think about something for a moment - nowhere near all of those Windows users are gamers. In fact with the world we live in that is so heavily populated with consoles I would be surprised if even half of the people using Windows are the type that go out and purchase the latest and greatest PC games (or even play casually). Linux users on the other hand are typically a more tech savvy bunch and tech savvy people more often than not tend to gravitate towards being gamers. Alright - enough speculation and assumptions, lets look at some cold hard numbers. Two recent games that had successful Linux ports would be 2DBoy's World of Goo and Frictional Game's Penumbra Series. 2DBoy reported that since they released their Linux port of the game 10% of their total game sales have been for the Linux platform. Frictional Games reports a similair statistic - in fact 12% of their sales for the Penumbra series up to this point are for the Linux operating system. 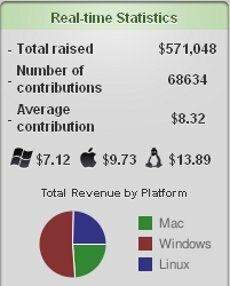 Judging by that pie chart Linux users appear to make up almost 25% of the donations and their average donation amount is almost double that of the average Windows user donation. This means that of the 571,048$ donated thus far 142,762$ is from Linux users. But remember Linux users are cheap and their is no money in Linux game market - right. Games that already exist on only the Windows platform need ports as well. In fact there is so much demand for some of these games to run on Linux that Codeweavers has a business commercially supporting many of these titles on the Linux operating system (it's not perfect - but for now it works). I can huff and puff about the facts and statistics till I am blue in the face, but the point is this: There is a market for Linux gaming and one that is still largely untapped at that. If you are a game developer I implore you to please port your game to Linux! Anyone know of any other games released for Linux that have been successful? Let me know! I am always interested in picking up a new game that runs natively on my systems. This is no doubt the Year of the Tablet computer. As such I began searching some months ago for a tablet I could add to my ever growing list of gadgets, I researched and played with many different devices before deciding on my Asus T91MT. I have had my tablet for a couple of weeks now and it amazes me how many people do not even know they exist when they released almost a year ago! The iPad on the other hand got more press than you can shake a stick at and everyone under the sun knows what it is after just a few weeks. Touch screens are fantastic, don't get me wrong but honestly some things are much quicker to do with a physical keyboard and a mouse. Having the option to flip my T91MT around and use it as a netbook is a wonderful option to have. Plus I personally feel my device's screen is much safer when I can "close" the screen instead of just sliding it into a case. The T91MT ships with Windows 7 Home Premium by default and my personal T91MT is currently running Linux Mint 8. While I am not saying the iPad OS is bad, it is a bit limited in the extent of what it can do and what it allows the user to do (doubly so if you don't jailbreak your iPad - until OS 4.0 releases the iPad is still a single-tasking device). The ability to install the operating system of your choice (full desktop operating systems at that) on the T91MT is wonderful and makes it an extremely adaptable device. Like most netbooks the T91MT has an x86 processor in it. This means it can run all of your standard applications you are used to using on a computer. The Z520 chip in the T91MT is clocked at 1.33ghz and has hyper threading, this will easily out perform the 1.0ghz ARM chip the iPad has. The iPad is locked at 256megs of RAM, the T91MT comes stock with 1gig of RAM and it can be upgraded to 2gigs. I use my netbook for presentations all the time - an external monitor output is a must have for this purpose. The iPad has no form of video out by default. Ever tried to push several gigs of data through a wifi connection? Even with 100% signal strength it is not a fun experience. The T91MT has a wired gigabit network connection, the iPad again lacks any sort of wired network connection by default. Not a huge deal for some people but having a built in SD card reader is useful for when you want to pull some images off that digital camera's memory card. I'm going to let you guess which device has an SD card reader and which one does not. This last point will more vary based on personal preference but as a student and future math teacher the main reason I wanted a tablet is so I can take written notes on the default with a stylus. The resistive touch screen on the T91MT allows me to do this while the capacitive screen on the iPad does not allow this with a normal stylus. These are the top ten deciding factors that lead me to purchasing the T91MT instead of Apple's new device. Did I miss any key points here? If so let me know by leaving a comment below. You know it is 2010 when you can be riding your bike home from work while listening to music streaming from the internet. I've been using Pandora Radio for some two years now and I have had a Pandora One subscription for the last year. When I received my N900 one of the first things I attempted to do with it was to load up Pandora via the webrowser as the device has full flash support - much to my dismay I was greeted by a choppy experience and a user interface that was difficult to navigate on such a small touch screen. The only feature pyPianobar currently lacks that I would like to see added is the ability to set the audio quality (often times I am streaming over 2/3G and would like to toggle it from "high" to "normal" quality). Over all pyPianobar is a fantastic application and just one more example of the power of the community that is behind Maemo! Some WINE with your Starcraft 2? It finally happened. I have a Starcraft2 closed beta key! What feels like decades ago now I had applied for a Starcraft2 beta key on Battle.net and had all but given up hope after many months of waiting when a friend was kind enough to give me one of his invite passes. I entered the key into my account and was thoroughly excited when I saw the beta appear in my downloads. I was clicking through the website as quick as I could so I could get the game downloading, when reality came crashing down on top of me as I hit the downloads page and was asked to choose between a Windows and an OSX client. What is a Linux user to do? With the recent release of Ubuntu 10.04 I had removed Windows 7 from my hardrive as it had not been booted into in over a month and was simply taking up storage space. My first thought was to simply reinstall Windows 7, giving it just enough space to boot and install Starcraft. Then I thought about the fact that I almost never reboot my system and that having to restart just to play Starcraft would be a real kill joy (and a time waster). I run all of my source engine games on Linux via CXGames however upon looking at their entry for Starcraft II I had little faith that it would work under Crossover. Not quite ready to give up hope yet I headed over to the WINE AppDB entry for SC2, lo-and-behold it had a gold rating! 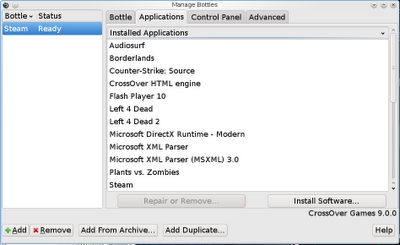 Browsing through the page you will find a wonderful HOWTO for recompiling WINE from git with a custom patch for SC2. Always one to jump in with both feet first I promptly uninstalled my current WINE version from my system and began downloading/compiling a patch version of 1.1.43 Twenty minutes later (I have a fairly good processor) I had the patched version of WINE built and installed. I then proceeded to download the beta client and get it installing under WINE (I also followed the directions here that contains some extra tweaks for running the beta under WINE, it also installs SC2 to it's own WINE prefix). 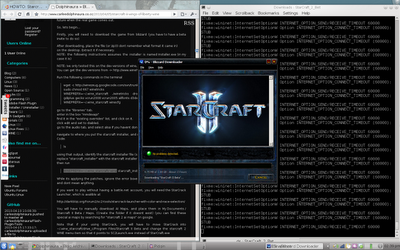 I have been happily playing Starcraft 2 under Ubuntu 10.04 for the last three days now. All I have to say is that it is a true testament to how much progress the WINE project has made in recent years when it can be counted upon to run a new title that hasn't even been fully released yet! Performance under WINE is not perfect, but on lower settings it is more than playable (which is what really counts). There seems to be a processor bottle neck on higher detail settings (also present in L4D2 under WINE actually) that hinders performance. E17 is a lightweight window manager/bundle of libraries for Unix based operating systems. E17 is designed to be both elegant and fast - two goals it succeeds at very well. The only problem is that installing E17 on Ubuntu (and it's derivatives) is not a very straight forward process if you have never done it before, the following are the steps I have taken to get the E17 environment up and running on Ubuntu 9.10 (however it should work for all Ubuntu based systems). EDIT/Update: If you are bear to try and compile/configure E17 yourself, I am the leader of a project known as Bodhi that provides regularly updated enlightenment packages on an Ubuntu based system. 10.10: Add the package autopoint to the above list. 10.04: Add the package libxml2-dev to the above list. 9.10: Add the package libxkbui-dev to the above list. Go get a cup of coffee or something, the length of time the above command takes to complete depends on your Internet connection and computer speed. Step 3: Now assuming the commands you ran in step 2 finishes without issues/errors check the output in terminal, it should mention some "environmental variables" that need to be set. Copy and paste each of the export lines it lists to you and run them in terminal. Log out of your current desktop and select "Enlightenment" from the log in options you are presented with in your login manager. Enjoy your new E17 powered desktop! Also please remember E17 is considered beta software - so it is not encouraged to use it on production machines. Lastly I would like to also say that while the default configuration of e17 appears crude at first, this is intentional. E17 is extremely customizable. Play with settings, move things around, add and remove objects and you will see creating a beautiful and customized desktop is just a few clicks away!